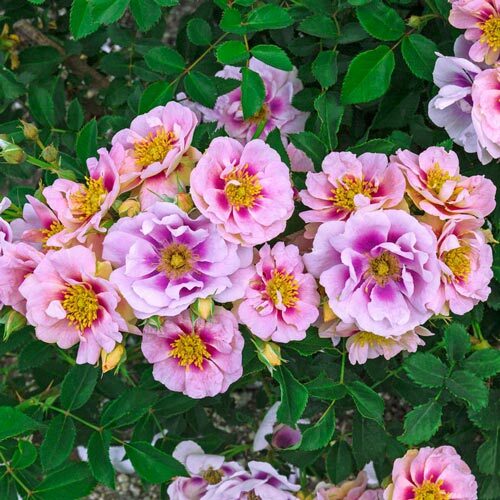 This uniquely colored shrub rose deserves a prime spot in the garden! Clusters of lavender-pink flowers with large, magenta-purple eyes really stand out against the dark green, glossy foliage. Each cluster has an amazing 15-20 blooms with a moderate citrusy, spicy fragrance. Grows 4-5 ft. tall. Easy on the Eyes, like other shrub roses, is a hardy, trouble-free rose that provides easy landscape color. Grow as a specimen plant or group together for an informal, carefree garden. Blooms from late spring to fall. Plant in full sun to part shade. Zones 4-10. Flower FormSemi-double, borne in large clusters. Medium-small flower size, about 3 - 3 1/2 inches. Medium pink with magenta heart that fades to lavender. PruningRemove dead, broken, or diseased canes. Remove fallen petals and spent flower heads to help reduce insect and disease problems. DepthSoak the bareroot in water for an hour. 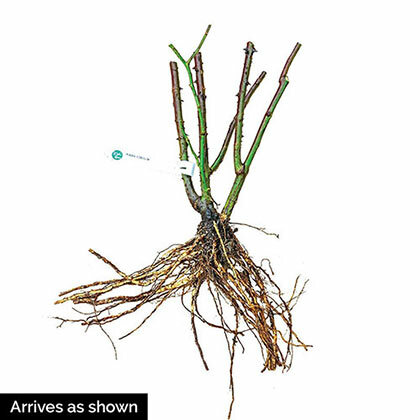 Dig the hole twice as deep and twice as wide as the root system. Mound a small pile of soil in the center of the hole as a support for the rose's root crown. Be sure to keep the bud union just above the soil line.